Eyeko has four more shades for summer and fall... Though I'm thinking we've seen two of them before! Punk Polish (for neon nails). This is a bright nearly-neon pink creme. They've done a Punk Polish before, but this seems to be an updated version. I will have to find my old bottle to compare, but this 2010 Punk Polish in the tall bottle seems quite a bit brighter than the previous incarnation. Rain Polish (for city nails). This is a beautiful, melancholy pale grey-blue with fine silver shimmer. Great concept, great execution. I love this color, it's perfect. Saucy Polish (for naughty nails). This is a flaming red creme. Very bright and obnoxious, just the way I like it. It does remind me of Eyeko's previous Red Nail Polish, but again, I haven't compared directly. It could be another updated version. The formula on these is much improved from a lot of the previous collections. Punk, Saucy and Rain gave me no application problems but Chi Chi was a little thick and sheer, which is kind of a difficult combination to work with. Three coats of each shade are pictured and the opacity is pretty good on all but Chi Chi. I miss the old cute bottles with the wide mouths and silver caps. These new bottles just aren't cute! But they are still small and convenient... But easy to tip over and not as chibi looking. I've been following for your blog for something like two years. I love the swatches and your humor. I had to give a shout-out because you reference Dragonball, which my kids (and husband) are obsessed with! Hey, they've got 2 new ones out. Military is a fabulous green. Just you wait! Wow all of them are fabulous!!! Love the Chi Chi polish. Is that picture from Ranma 1/2? Rain polish is really pretty. As Jaljen said, there are 2 more new Eyeko polishes: Military and Pastel. But Pastel is also an old one reformulated. 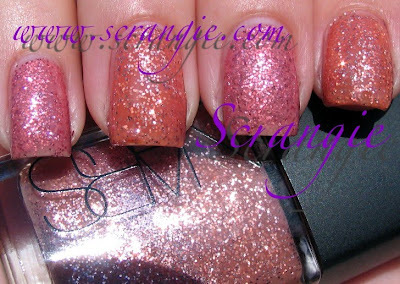 I've tried Chi Chi with Tea Rose Eyeko polish that's wonderful!!! I love the Chi Chi reference. Rain polish is my favourite out of all these. Rain is quite a bit like Illamasqua Raindrops isn't it? While not my usual preference, there is something about Chi Chi. It must be the boatload of glitter. I think it could also be called 'Poodles from Outer space: For Intergalactic Nails'. Rain is exactly what I like. It's super pretty on you. Ok, did you seriously use a DBZ reference and later said, "chibi"?!!! I think I'm going to start using "Scrangie" in place of "awesome" or "wow"!! The old Eyeko bottles are definitely cuter, but the caps look like they would make application fiddly! I own and LOVE Saucy (cutest packaging EVER!) 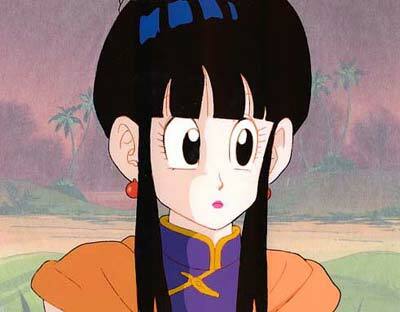 and seriously want Chi Chi and Rain! Love em! Especially Rain and Chi chi! Saucy is a beautiful red. Just the right shade for me. Chi Chi is a gorgeous glittery pink. Rain is pretty also. Punk Polish is nice but seen it before.